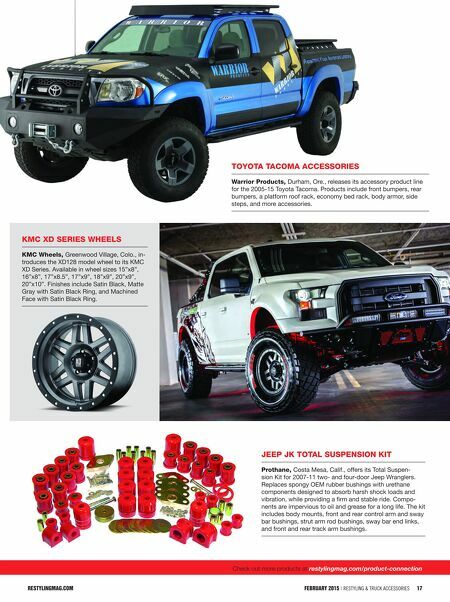 restylingmag.com FEBRUARY 2015 | Restyling & tRuck AccessoRies 17 Check out more products at restylingmag.com/product-connection toyota tacoma accessories Warrior Products, Durham, Ore., releases its accessory product line for the 2005-15 Toyota Tacoma. Products include front bumpers, rear bumpers, a platform roof rack, economy bed rack, body armor, side steps, and more accessories. Kmc Xd series WHeels Kmc Wheels, Greenwood Village, Colo., in- troduces the XD128 model wheel to its KMC XD Series. 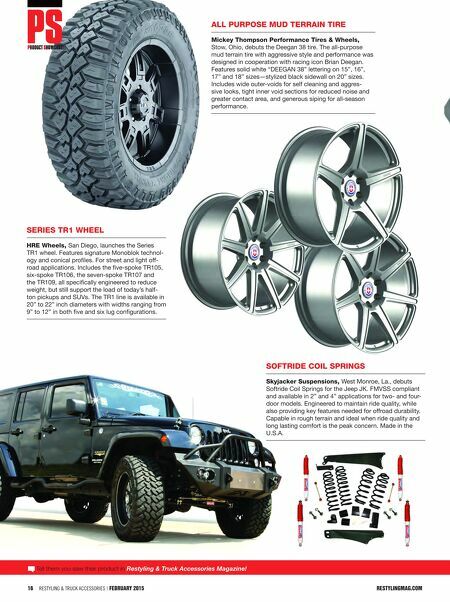 Available in wheel sizes 15"x8", 16"x8", 17"x8.5", 17"x9", 18"x9", 20"x9", 20"x10". Finishes include Satin Black, Matte Gray with Satin Black Ring, and Machined Face with Satin Black Ring. JeeP JK total susPension Kit Prothane, Costa Mesa, Calif., offers its Total Suspen- sion Kit for 2007-11 two- and four-door Jeep Wranglers. Replaces spongy OEM rubber bushings with urethane components designed to absorb harsh shock loads and vibration, while providing a firm and stable ride. Compo- nents are impervious to oil and grease for a long life. The kit includes body mounts, front and rear control arm and sway bar bushings, strut arm rod bushings, sway bar end links, and front and rear track arm bushings.